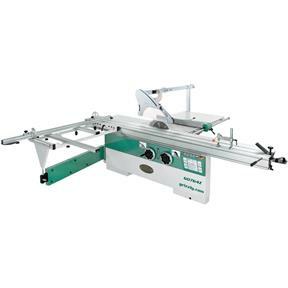 Leave it to Grizzly to offer yet another industrial sized Sliding Table Saw that's engineered to handle the largest sheet material. With 4-1/8" maximum depth of cut at 90°, this saw handles the thickest material for crosscutting and ripping. The independently controlled scoring blade eliminates tear-out and two flip stops on the crosscutting fence maximizes production efficiency. The large overhead blade guard is fully adjustable and includes a 4" dust port, which supplements the 5" cabinet mounted dust port. 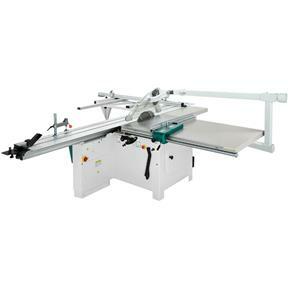 If you require a large sliding table saw, take a good look at this one! Depth of cut at 90°: 4-1/8"
Depth of cut at 45°: 2-7/8"
Maximum sheet capacity: 124" x 134"
Approximate shipping weight: 1643 lb. *Prewired for 220V. 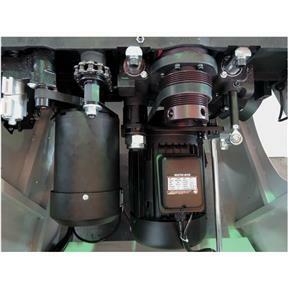 If you require 440V operation, Grizzly must convert your machine at the time of purchase to maintain the machine's warranty. A $250 non-refundable fee will be added to your order. Please allow extra shipping time for the conversion. If you need more information, please contact technical service at 570-546-9663.